It Gets No Better Than Working With Andrew Ayler!! Wow, what a customer! Thank you so much for your business and referring your daughter to us. We appreciate it greatly. Had such a great experience with Dan Balsom and Tyler Massaro. I got such a great deal and great service. LOVE my new Santa Fe. This is my 2nd car from Dan and I would not go anywhere else. Have sent many friends and family here with the same wonderful experiences I had. Thank you for your kind words, Donna! We appreciate your continued business. I recently worked with Andrew, and let me tell you he went above and beyond to work with me and get me into exactly what i wanted. He made the process f smooth and simple for me-literally stress free! I've had terrible luck at other dealerships, but Northtown was great. I don't think i would go anywhere else other than Northtown. Andrew knew exactly what he was doing, and kept me at ease during the whole process! Even when i asked a million questions, he always got me the answers i needed. I highly recommend Andrew to anyone looking to get into something new or used. He is definitely a great attribute to Northtown Hyundai. This is wonderful to hear. We will make sure to pass along your kind words! The employees of this location go above and way beyond to help customers, past/present/future. Everytime I have an issue it is handled with the utmost care, Thank you Northtown Hyundai! Roberta, This is what we love to hear. Thank you for your business and for trusting our team! I highly recommend BILL FECHNER!! I had an old car that I thought I was buried in, owing more on it then it was worth! - but Bill and his team did amazing work to get me UNBURIED and into a beautiful new car!! I am so THANKFUL!!! 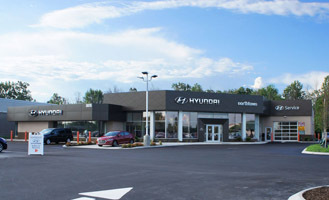 It is a Beautiful brand new Dealership with an amazing staff! Bill Fechner took great care of me! He is very knowledgeable and he took the time to explain everything, not to overwhelm me. & he was FAST!- It didn't take all day to happily drive off in my new car! I HIGHLY recommend him! He was very patient and got me a GREAT DEAL!! The management team goes above & beyond! Brian Sider is always amazing to work with! From the bottom of my heart, Thank you, THANK YOU, everyone at NORTHTOWN!! Thank you for your kind words! We will be sure to pass this along . Thank You for your business!